A limited budget is always a headache for small and medium-sized businesses. It restricts them to open their arms and operate their business widely. Unwillingly many of the business activities have to be kept aside because of the limited budget, and marketing is one of them. When talking about internet marketing, web traffic is one of the most important and primary points to consider. Even though the ultimate goal of online marketing is to create sales; driving traffic is a crucial step in the process. When you focus on how you’re going to drive relevant traffic than how to rack up sales, you are likely to think out of the box and come up with creative ways as to how you can reach out to a wider audience and spread the word about your brand. And for that, you need to lay out an attention-grabbing and traffic-driving approach to your marketing. So, now as you know, that web traffic is important, the question is how will you drive traffic cheaply? Smart Content Marketing, of course. Even with a limited budget, content marketing can work wonders on the website’s traffic if you do it the right way. When it comes to executing content marketing on a budget, you will probably have to create all the content on your own. So, decide what type of content you are going to create. Is it going to be blog posts or how-to guides? Or podcasts seem more feasible to you? Once you have decided your genre, you can start thinking about how you can create engaging content for your audience. In-depth how-to guides, blogs, videos and podcasts are some examples of this content marketing method. If you have short-term content marketing goals, it would be helpful to create content like case studies that talk about how your product and services helped users achieve their goals. Community (that includes followers, consumers, subscribers and even prospects) is a powerful resource for new and small businesses. Build a strong community of people who use and admire your product/service together on a single platform so that you can enjoy higher brand credibility, business integrity, brand reputation and customer loyalty. The approach gets even easier and more fruitful when combined with content marketing. Make optimum use of social platforms such as Facebook, Twitter, Instagram, and Pinterest, etc. for maximum exposure of your products and services. Promoting your business (products and services) online in a limited budget is a challenging task; however, by optimising your efforts and spending your limited budget only on the high-impact marketing strategies, you can ensure the best value for every cent you invest in your marketing. The internet marketing activities listed above are the easiest way to endorse your business online. But, ensure success, you definitely need to be prepared to put in a lot of time and efforts. Webmate is an internet marketing company in Brisbane, offering you all sorts of assistance and support you need to promote your business in the competitive digital landscape. To know more about DIY internet marketing strategies or to hire a digital marketing expert for your eCommerce store, please contact us at https://webmate.com.au. What should be the lifespan of my website? When should I consider website redesigning? What should I do to keep the customers engaged? 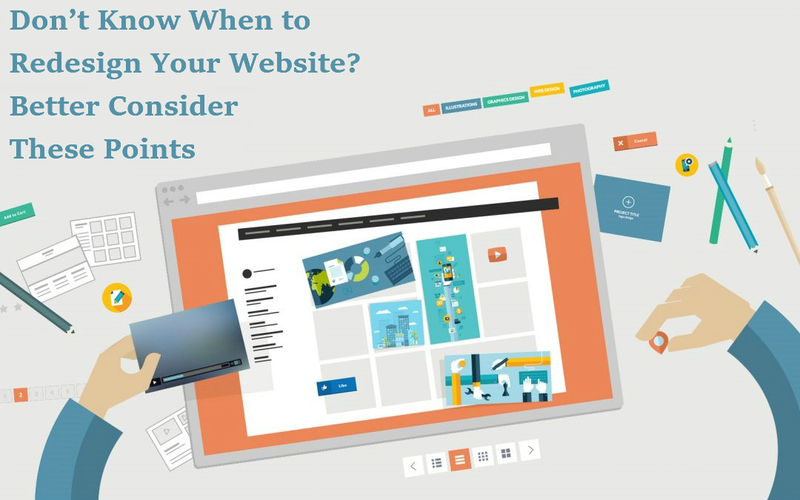 Here are some points to help you decide when you should redesign your website and what you should do to keep your customers engaged. Is Your Website with Outdated Designs? Look of a website is quite crucial. Therefore; design of your website should not look outdated or old. Your visitors / customers can easily figure out outdated website. In the stance of fierce competition, you cannot afford to have a website with outdated designs and images; hence, you should redesign your website. Is Your Website with Outdated Contents? The content that is fresh, unique and informative today, might drop its importance in a few months or a year. To keep the website’s flame alight, you should regularly update the contents on your website and also post fresh articles and blogs to keep your customers engaged. At Webmate, we believe in ‘content is the new SEO’. We utilise informative and stimulating blog posts, video, infographics and engaging content to keep traffic coming to our site. Therefore, if your website is with outdated contents, then you should consider updating these contents. Is Your Website with Outdated User Experience? Websites that employ the newest design trends and understand users’ behaviours tend to be far ahead of the game. UX and UI designers can really help you get the best out of your site, not only by implementing new and innovative functionality but, providing the best possible experience to your users and potentially converting them into customers. There’s tons of contradictory information available over the web, some would say bias regarding how long a website’s life expectancy is. Therefore, based on the above points, judge by yourself that whether your website needs to be redesigned or not. If you need help, you can contact us (Webmate) for any sort of help and assistance related to web design and development in Brisbane, Australia. Based on our years of experience, we highly recommend you to choose a web development company that can work with your team to understand your core business and develop a website that showcases your services or products. For a free consultation, you can contact us at https://webmate.com.au/contact.